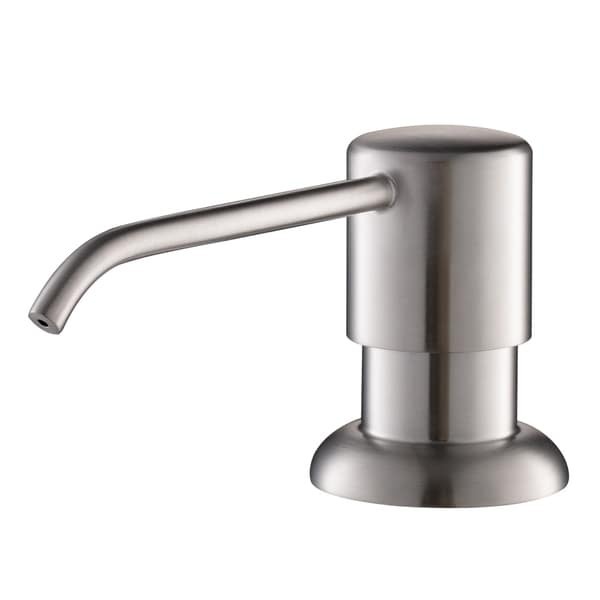 The perfect complement for your kitchen faucet, this easy-push self-priming soap dispenser is ideal for dispensing soap onto a sponge or directly into the sink. The large-capacity bottle holds 17 oz. 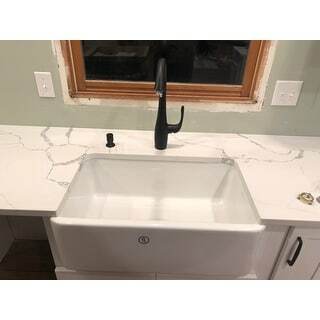 of liquid soap, lotion, or liquid detergent, and refills from above the counter for maximum convenience - simply add soap from the top of the dispenser, with no need to go underneath the kitchen sink. A threaded connection makes installation easy, with a tight waterproof seal above and below the counter to protect against leaks. The pump rotates 360 degrees, so you can position the nozzle anywhere you need it. Comes in a choice of five flawless finishes to match any kitchen faucet. Dimensions 3.88 In. X 5.24 In. X 12.34 In. So easy to use. Drip free. Easy to fill from the top. Holds a large bottle of soap. Keeps from having a soap bottle on the window sill. Doesn't stain the top with a soap bottle on it. Easy pump to use. We are really liking this soap dispenser, as silly as that sounds. It was easy to install, matched our other fixtures perfectly, and works really well for us. The nozzle is decently long so it hits the bottom of the sink, but not too long that it would be in the way. 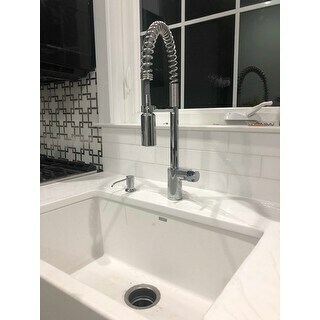 We bought this as a replacement and it matched our existing faucet perfectly. Very nice quality product and a great price. It was very easy to install. Looks great and matte black finish is just what I was looking for. Only four stars because I’ve noticed after pumping the soap continues to drip a bit into the sink. Not a deal breaker but wish it didn’t do it. Exactly as described. Must have for a kitchen. It came very fast. Very good quality and shiny. We got a lot of stuff for our home during the renovation and we are happy about overstock costumer service.